It’s more than 10 years now, that our company is active in this particular market, primarily through the wooden coasters built by us, but also for other products such as Toboggan runs and reception-buildings. An interesting example may be the Wiesmann Gecko, which was realized by us in Dülmen. The other references in amusement rides and buildings you can find here. Your contacts for amusement rides and buildings at your disposal for your questions. For years we have been working with one of the most renowned engineering companies in the roller coaster industry, the ‘Ingenieurbüro Stengel’. To further ensure that everything fits right from the beginning, our own construction office creates the entire CAD-planning and the secondary support system. and resilience which optimizes the quantity of wood and minimizes the amount of scraps. For our production we only use preselected wood, which is then assessed by an external inspection-office. That is how we ensure that only the best and most load-bearing wood is processed. We treat our wood with a vat-pressurized impregnation after it is cut. That is how the cross-grained timber ends and the now already existing boreholes are especially protected and weak points, that can emerge from processing pre-impregnated, package ware wood on the construction site, are avoided. Another positive aspect is environmental protection – by processing the wood this way no impregnated wood scraps are generated. In terms of the profitable amount we follow the strict Scandinavian NTR-Impregnation guidelines which dictate a broad protection of the wood even with constant water contact. That is how we prepare our roller coasters for a long lifetime. of our wooden coasters through the usage of special display wood is self-explanatory. That is how we ensure that Cordes Coasters are an eye catcher as well. Every connection of our roller coaster is reviewed and executed by ‘Ingenieurbüro Stengel’. All of the fasteners and every steel piece used by us is hot-dip galvanized and therefore rust free. For bolt connections we use customized dowels which has the advantage of reduced fastener usage and causes less slippage. Our delivery package includes all necessary steel pieces. Stair grade consoles, stair beam consoles, batterbrace connections, enforcing steel profiles and fundament anchors. That is how we guarantee that what belongs together, fits together. 8-layer track of vat-compressed impregnated pinewood which is processed by the high standards of the Stengel offices, including all of the steel coatings and fasteners and a track course calculated by heart line. Only Cordes Coasters offers you a track connection through special screw-nails and bolts as well as the fixation of every single layer through adhesion. That is how our coasters stay on track an entire lifetime. The controls, the trains and the low-maintenance magnetic breaks are built and delivered by the experienced roller coaster company ‘Gerstlauer’. That is why our maintenance costs are up to 2/3 lower compared to those of other producers. Cordes Coasters are always delivered and executed with all the fasteners including, catwalks, stairs etc. Upon request the park associates can be integrated in this process. The pre-assembly through our team is conducted inside of a special tent on site. This tent as well as all assembly appliances, the necessary lift vehicles and cranes are always included in our deals. That is how no hidden costs can emerge. Security is on the top of Cordes Coasters’ list. That is why we offer the TÜV-inspection immediately, upon request. Should the assembly be conducted through our team, our deal can also include a five year guarantee. This includes annual visits from our team which then checks the entire construction for damages and abrasions. Should we find damaged timbers, we will replace them – without any additional costs, of course. We also inspect bolts and fasteners and adjust them if necessary. In 2008 a first toboggan run was built in the zoo of Hannover, which is operated with snow in wintertime and with water in summertime, and which has been used by many visitors. 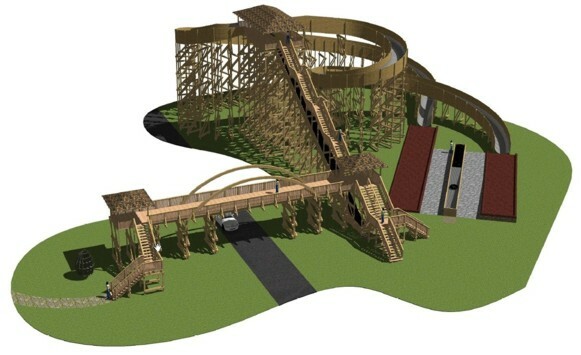 In Hannover the ride was installed on a small mountain, but on the basis of this project we have developed a concept to create toboggan runs in open terrain with a rollercoaster-like structure. All arguments that apply to our roller coasters, are therefore also valid here. A feasibility study is shown below. We’ll be glad to develope a particular concept based on specific requirements. Of course, we expect to provide a complete toboggan run, including the required technology.